Christmas has come early, boys and girls. 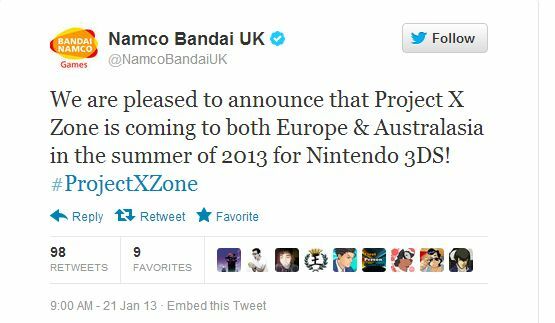 Though it seemed impossible that we’d see another crossover on the scale of Project X Zone, a fighting game/RPG hybrid developed by Banpresto and Monolith Soft for the Nintendo 3DS, it seems Namco Bandai UK has allayed those fears via Twitter by announcing the game’s release for Europe and North America this Summer. That’s right: We’re finally going to be able to go at it with Namco Bandai, Capcom and Sega characters in arguably the biggest crossover since…since forever, actually. Project X Zone features over 200 characters from legendary franchises like Darkstalkers, Virtua Fighter, Street Fighter, Devil May Cry, Mega Man, Xenosaga, Tekken and many more. It was released in Japan on October 11th 2012 and immediately generated fervor due to the sheer amount of characters it featured. Usually crossovers don’t see much exposure outside of Japan, due to rights issues, but Project X Zone is just too good to ignore.